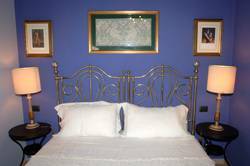 Set in its own gated gardens, with palms and trees, Castello D'Urso Somma B&B is composed of 10 air-conditioned guestrooms, all ensuite, which feature bright, modern decor with antique Sicilian -style furnishings. Rooms, all different in size and furniture, are in groups of five, housed in 2 self contained annexes around a historic Castle, providing access to a kitchen/central breakfast room in each of the annexes that opens up onto a large patio area. Complimentary Buffet Breakfast is provided in "your" kitchen so guests get up and help themselves when it suits them. A coffee machine, a microwave, a toaster, a kettle, complete with a fridge, will be available at all times. 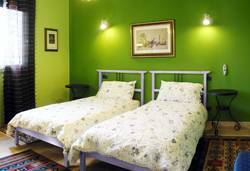 Housekeeping is provided everyday if guests are so kind to leave the room by 10:30 a. m.
If you like staying away from the bustle of the city, the location is very quiet and the countryside setting helps to enjoy a relaxing stay. until the end of September although dates vary according to the local weather) surrounded by palms and complimentary on site parking. The property does not have a restaurant or bar, but there are plenty in the centre of Catania. 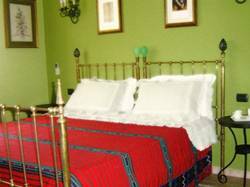 A warm welcoming and a friendly hospitality, which are typical values of our tradition and culture, combined with an exquisite tranquility, are the essential features of our Bed and Breakfast. Rooms, different in size and shape, are situated on the ground floor, and feature a lovely-nice mix of modern and antiques. They are so individual equipped that you can easily feel at home, at ease and relaxed. All ensuite, with stylish modern bathrooms ( with shower only) and lots of thoughtful touches, guestrooms offer a/c climate control, cable tv (Italian channels only), closet, desk, manual roller blinder and hair dryer(on request). The B&B is conveniently located for guests who want to spend a day at the beach or go into town for shopping . 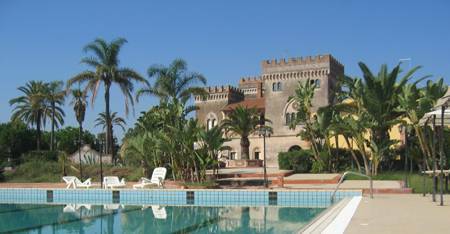 It is 300 metres from the beach, 6 min by car from Catania Fontanarossa Airport and 8 kilometres from Catania Old City Centre. Although it is within walking distance of the town and beaches, there is no footpath or pavements along the busiest section of the road, so walking is definitely not advisable. In addition to this, we always reccommend to rent a car, first of all because our island does not provide good transportation services . Besides, our location is also very convenient for exploring most of the island, since the main motorways are a couple of minutes away from our property (Taormina 45 min; Siracusa 1h; Mount Etna 1h 1/2); consequentially, being independent with "your" car means you can travel around Catania province and beyond all day long, and then feel you are at home, once back at the property. Restaurant offering from regional to national dishes. 도착하기 전에 추가 보증금을 요청할 수 있습니다. 그렇다면 예약을 확인한 후 바로 연락을드립니다. if a guest cancels within 14 days of arrival, we apply a penalty corresponding to a one night's charge ( on a 1 to 3 night stay) and a two night's charge (on a 4 or 5 night stay). For a no show, we reserve the right to charge the guest's credit/debit card for the entire amount. GUESTS ARE STRONGLY ADVISED TO TAKE OUT APPROPRIATE HOLIDAY CANCELLATION INSURANCE. A) Will you rent a car? Before leaving your country, please visit our website and click on the map you'll find in the "contacts" page. small roundabout. Turn right in the direction of "San Giuseppe la Rena" and the property is the second gate on the right (no. 15). If, instead, you'll have a GPS in the car , just put in longitude 15° 4'39. 59"E and latitude 37°26'48. 57"N.
You'll be driven directly in front of our property. B) Will you come by taxi? Please , negotiate the price before you take it or ask the driver to put the taximetre on. way trhough its end and turn right at the small roundabout.